ORTLOS Space Engineering is a transdisciplinary design studio that develops immersive participatory environments and expanded spatial experiences through innovative technological systems and strategies. However, instead of focusing on the relationship between human and machine, Responsive Public Space explores new potentials of human-to-human relationships within urban and architectural spaces that foster human intimacy and social engagement. This workshop will investigate and demonstrate the phenomena of closeness between agents observed by technology (person tracking) within immersive environments. In urban open space agents are constantly interacting. Dealing with unknown and unexpected situations, and often involved in subconscious emotional exchanges, the agents create an invisible social space. 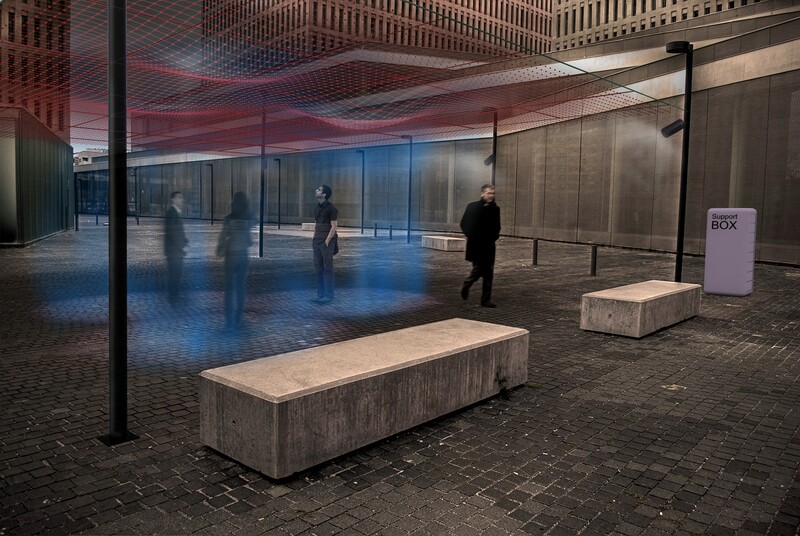 Based on Responsive Public Space demonstrator, the workshop will explore and creatively visualise this tension between random users operating within a defined area. Materialising and representing this abstract space also provides information and knowledge about the users themselves. Through the constant redefinition of the virtual environment, participants may develop a new sense of space and expand their everyday perception of and interaction within (urban) spaces. Workshop tools: participants will use processing, audio software and advanced tracking system to express their creative approach within an immersive audiovisual composition. Workshop requirements: each participant will be required to bring a laptop computer. Ivan Redi is an architect, designer, researcher, educator, and co-founder and principal of ORTLOS Space Engineering (since 2000). He has a wide range of experience and expertise in advanced architectural environments and interface designs. Ivan teaches and lecturers across a range of institutions, including TU Graz, UCL London, and in Vienna, Graz, London, Belgrade, Berlin and Stockholm. His work has been exhibited worldwide, including at 2000 and 2008 Venice Architecture Biennales. He is currently involved in transdisciplinary collaborations, while investigating holistic information structures, immersive augmented environments and emergence of responsive spaces. Andrea Redi is an architect, co-founder and principal of ORTLOS Space Engineering, Office for Advanced Architectural Solutions (since 2000). She has a wide range of experience and expertise in regenerative architecture, management, supervision and realisation of complex research projects. Her work was shown, inter alia, at 2000 and 2008 at Venice Architecture Biennales. From 1995 Andrea has taught design courses at TU Graz, and from 2009–11 she taught at UCL Bartlett in London. She also lectures and exhibits worldwide, including in Berlin, Graz, London, Kosice, Stockholm, and Venice. Brigitta Zics is an artist, media philosopher and interaction designer with a particular interest in emerging technologies and their impact on creative practices and human cognition. Her main focus is the philosophical investigation of human experience in technologically enhanced environments. Recent research subjects include experimental data visualisation, bio-signal interaction, affective games, application of swarm theory, and environments that facilitate immersive experiences. She is interested in collaborative ecologies that foster innovation through creative making and open technological production. Hubert Machnik is a composer and guitarist. He performs in various, mainly ‘Neue Musik’ ensembles and orchestras. He composes piano and chamber music, music for theatre, dance, film and audiovisual installations, computer and electronic music, and radio works. From 1981–89 Hubert was a member of Ensemble Modern. He has performed concerts worldwide, including in Tokyo, New York, Montreal, Toronto, São Paulo and throughout Europe.